The Autumn Bulletin No.126 is out! The Autumn issue of the ORC Bulletin (126) has been printed and mailed out to subscribers and supporters! 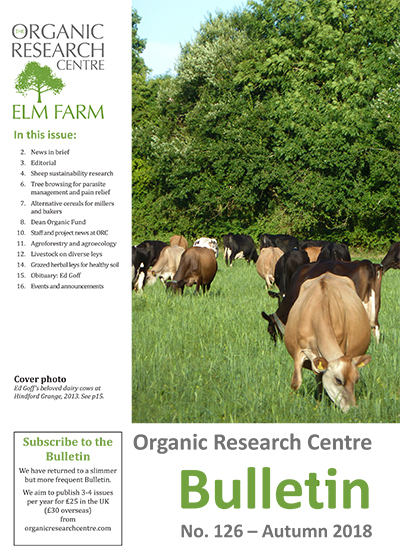 The issue has an livestock focus with articles on; sheep sustainabityy research, tree browsing for parasite management and pain relief, livestock on diverse leys and grazed herbal leys for healthy soil. There are also features on; Ed Goff (obituary), Dean Organic Fund recipients, alternative cereals for millers and bakers, agroforestry and agroecology and much more! The Summer issue No.125 is now also available for free download here.